Happy Thursday! It's been a while since I posted on my blog. I've been on a "mommy hiatus" for the past two years, enjoying my little boy. I'm excited to start crafting again! 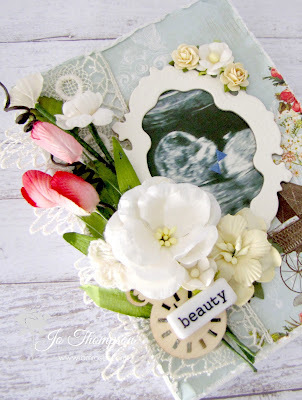 Today a new challenge is up at the I Am Roses Challenge Blog. Here is a keepsake box that I created. As a mommy busy trying to raise a little human being, sometimes you don't have time to scrapbook all the pictures you take. So I decided to create this little keepsake photo box. I will print out one picture of every month for the first year of his life and put it in here. It's small and won't take up too much time to complete. I used mainly cream and white flowers, with a pop of red. The paper I used is Webster's Pages Lullaby Lane and I distressed the edges. The photo is the ultrasound picture that I used to announce my pregnancy. 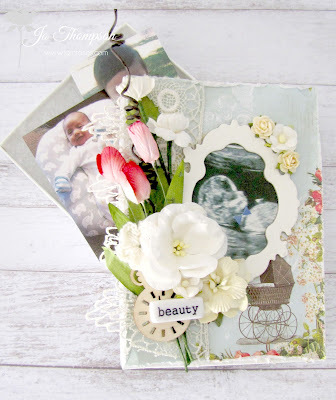 The frame I used is from Tattered Angels. 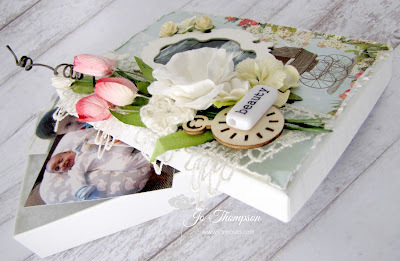 The photo box is finished off with some lace, a clock wood veneer and a little word piece.